Well, the Yuletide season has passed. A new calendar year is upon us and the same troubles are more and more obvious. We mustn't let ourselves be fooled by the media/mind control merchants. There is still terrible injustice, pain and suffering going on - and only reading, studying and following the plan can save us from it. Everyday we are led to believe that this year will be better, this year will be different. It may be a new calendar year, but the same problems affect all of us. Those that have read TWHOFTF will know that there will be no let up. If we do not stop the dictators/rulers of the world from running/ruining the world, The End is inevitable. Like many others, I went through the religions pretty fast, attending most only ONCE, some walking out in a matter of minutes, and one even sucked me in for a few years because it was a close counterfeit. Just a quick testimony on TWH. ...4 months ago I received an e-mail with the JAH Truth web-site as a link. I believe it was inspiration that led me to the Web-site. 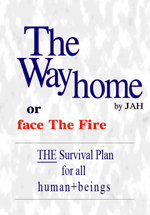 I read every document and finally ordered "The Way Home or face The Fire". ...I finished reading the book... And then finally I ACCEPTED the book and the site.